For hundred centuries, the Emperor has been in his Golden Throne, and his Primarchs and Space Marines take it with all the threats to mankind. These godlike leaders had created the warriors with superhuman abilities, thus unifying the worlds of men. Now it is about securing the spear of the Khaine so that it does not fall into the hands of the Orks or Eldar. This is a powerful weapon found on the planet Archeron. Space Marines have inhuman forces, biological and cybernetic implants, and have been transformed into the elite forces of humanity through genetic manipulation. With their Power Armor they are even more powerful and all gene manipulation leads to an enormous prolongation of life expectancy. These Angels of Death are headed in Dawn of War 3 by Gabriel Angelos and currently have 13 unit types. In addition to the units, there are also elite units to reinforce your troops. This will allow you to clear the game over time and then set it before the start of a game. The range of your army should show you many well-known fighters. - Servitor: A unit with which you can find your nearby, hidden enemies. - Scout: Enlightenment unit with camouflage, paraffin grenades and mines. - Scout-Sniper: Sniper with very high range. - Tactical Marine: The standard unit with possible flame-mounted or plasma gun upgrades. - Assault Marine: Close combat combatants, which can overcome distances by jetpack and can quickly fall into the fight. They can surprise their enemies briefly before they get into the fight. - Lascannons: Marine with a heavy laser weapon that causes high damage to vehicles. The damage increases when the weapon is long directed at the target. The war machines also feature classics from the Warhammer universe. Rockets, Mechs and a lot of firepower: These are the vehicles of the Space Marines. - Land Speeder: Lightweight and fast unit, with which you can fly over abysses and by multi-Meta weapon upgrade can do much more damage against vehicles. - Death Storm Drop Pod: You can throw the capsule out of the orbit, placing five towers, which can shoot in all directions. However, they have limited ammunition and should be used tactically. - Whirlwind: An artillery tank that allows you to raid to a target area by command rockets. These are explosive over the surface and produce very high damage to the infantry. - Dreadnought: A big mech that falls into melee and goes off with various attacks and anesthesia on his opponents. - Predator Destructor: A tank with strong guns, which cause damage to the area and become a fright for the infantry. - Predator Annihilator: A tank with laser weapons and thus a counter unit for vehicles. - Use the distance combat: Scouts are very important at the beginning of the game, because otherwise they will only be able to reach the range of the other factions. - Distance fighting: You can manually switch from remote to melee to face your enemies. If your opponent is involved in hand-to-hand combat, they can no longer deal with remote enemies and gain an advantage. - Use as often as possible a combination of close-up and distance fighting in order to be as effective as possible. 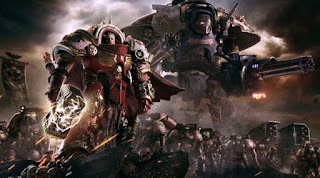 - Capsules: The Space Marines are a very important advantage! You can have units produced and have them discarded anywhere on the map. - The production of troops in the capsules takes more time, but they are tactically indispensable. - Surprise: Through the space capsules and the large range of the Whirlwinds you can start fast attacks and rub your enemies before they can lock themselves together. If you have any further tips on how you can be successful with the Space Marines? Then share your knowledge with us in the comments.